There was once a world that survived without washing machines, without detergents and without man-made fabrics. It was not so long ago. The weekly wash usually happened on Monday. There would be leftovers from the Sunday meal to make this a practical proposition. Washing was a major operation. The tools were a copper boiler, a mangle, a clothes line with a prop and a drying rack. Water and soap flakes were also required. Sheets and other cottons could be boiled in the “copper” with the soap flakes. 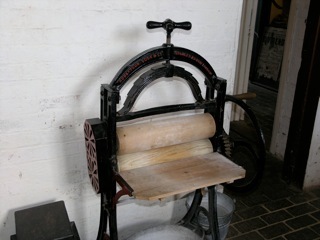 They were then squeezed through the mangle, rinsed in clean water to get the soap out and then mangled again. Everything was hung out on the line with old fashioned “cleft stick” clothes pegs with a prayer that it would not rain that day. If it did rain it only made the job harder. Smaller items and more delicate fabrics could be hand washed in the sink. Wool was prone to shrinking, so hand washing at a lower temperature was essential. 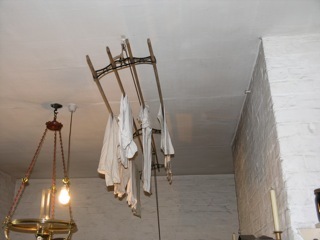 Once the clothes were more-or-less dry they could be brought indoors and hung on a drying rack, often an arrangement such as this on pulleys. Ceilings were (still are I suppose) much higher in these houses – probably at least 9 feet off the ground. Once dry, everything would be iron, probably in the evening and then “aired” in an airing cupboard – usually above the water heater. On a good day it could be all done on Monday, but if the weather intervened the work would continue on Tuesday.